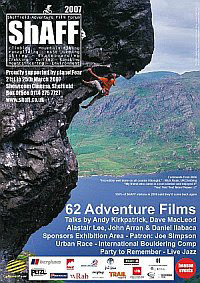 The Sheffield Adventure Film Forum is coming up soon, March 21 - 25. If you haven't heard of it, or bought your tickets yet then check out their website It has to be the best line of of climbing films (and non-climbing films) ever assembled for a festival. Rather than being a film competition that randomly relies on movies being entered to it, organiser Matt Heason seems to take rather more direct approach - deciding what films are needed and then sweet-talking or brow-beating the film makers until they say yes. From the Hot Aches stable there will of course be E11, (can there be anyone in Sheffield who hasn't seen E11 by now? ), which is being screened under the 'Best of Kendal' banner where is won the Judges Special Award last year. James Pearson is also giving a lecture, so look out there for a sneak preview from our new movie 'Commmitted' with footage of Jame's ascent of The Promise E10 7a. Other things to look out for include some footage of James' recent bouldering spree in Switzerland, courtesy of Crabstix Productions as well as a section from the recent Winter Sessions movie . From the Slackjaw team 'Esoterica' is getting it's first screening. 'Cobra Crack' is a must see for any climbers. Well there's loads more... including a bouldering comp at the Climbing Works that should be good entertainment. Unfortunately we've got some TV work lined up in Sweden so won't be there ourselves.